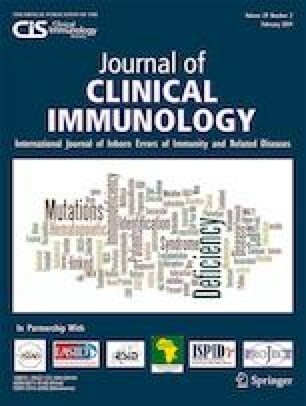 X-linked anhidrotic ectodermal dysplasia with immunodeficiency (XL-EDA-ID) is a primary immunodeficiency disease (PID) arising from the mutation of IKBKG that encodes NF-κB essential modulator (NEMO). Clinical expressions of the disease are characterized by abnormal teeth, hypohidrosis, sparse hair, and the immunological defects of impaired antibody response to polysaccharides, hypogammaglobulinemia, and impaired natural killer cell cytotoxicity. Patients are susceptible to infections with pyogenic bacteria, mycobacteria, parasites, viruses, and fungi . Inflammatory bowel disease and autoimmunity are notable complications affecting the growth of pediatric patients. The online version of this article ( https://doi.org/10.1007/s10875-019-00626-3) contains supplementary material, which is available to authorized users. We sincerely thank Dr. Noriyuki Kaku, Dr. Yoshitomo Motomura, Dr. Katsuhide Eguchi, Dr. Akira Shiraishi, Dr. Kanako Ishii, Prof. Hidetoshi Takada, and Prof. Tomoaki Taguchi for valuable advices. We are grateful to Dr. Yui Nozaki and Prof. Yoshinao Oda for pathological diagnosis. This work was supported in part by Practical Research Project for Rare/Intractable Diseases (JP16ek0109099) and Grant-in-Aids (JP16ek0109098h0002) from the Japan Agency for Medical Research and Development (AMED) and the Research on Measures for Intractable Diseases Project and Health and Labor Sciences Research Grants (Research on Intractable Diseases) from the Ministry of Health, Labour and Welfare. The contributions of each author are as follows. YI, MS, MI, and SO were the principal investigators, taking primary responsibility for the paper. MS completed the immunological studies and genetic analysis. MI established the immunological screening, quality control of the tests, and genetic counseling.